Lee Hyuk-jae (born April 4, 1986), better known by his stage name Eunhyuk, is a South Korean singer-songwriter and actor. 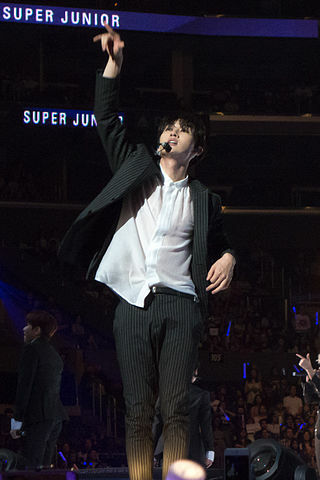 He is a member of the South Korean boy group Super Junior and their subgroups, Super Junior-T and Super Junior-H. In 2011, he joined Super Junior's Mandopop subgroup, Super Junior-M and the duo Donghae & Eunhyuk; active in China and Japan respectively. Characters Yesung/Kim Jonghoon, Ryeowook, Kangin, Leeteuk, Sungmin, Jongjin and etc. Although they gave him the nickname Yesung for Jonghoon, they too gave the devilish name for him. Of course they would. A detective that use everything and everyone with all he wanted to are not much of a different from a sly demon. Right? Characters Donghae, Eunhyuk, monsters, white-collars. After spilling your drink on Donghae's T-shirt, you agree to make up for it by treating him to lunch. You intend to use this as an opportunity to get closer to him. After his brother and sister in law passed away, Heechul, a young adult with a free spirit style, discovers that they left the full custody of their 8 children to him. Wanting to do the best for his family, he will try to raise the kids like their parents wanted, however, things get complicated when he realizes he doesn't have any experience with kids. His luck only gets better when Leeteuk starts working as a babysitter. Every morning on his way to work, Donghae passes Hyukjae’s sweet shop, and every morning, Donghae stops to buy something. Donghae has a secret – he hates sweets. But he might just love Hyukjae.